The DPRO-92311 is a CCTV dome security camera designed for indoor video surveillance applications. This video demo shows the normal and low light video surveillance performance of the camera in an office setting. For the best viewing experience, start playing the video, then select the highest video quality setting by clicking on the video settings button on the bottom of the video player. In this video we test the normal light and low light performance of the DPRO-92311 indoor dome CCTV camera. The DPRO-92311 supports 650 TV lines of resolution and has a fixed 3.6mm lens which provides a 90-degree field of view. Let's get started. I start with all the lights on in the office and I'm about 20 feet away there when I start and I approach the camera and I stop at about 6 or 7 feet away. You could see the camera has great color performance. It looks great with all the lights on. I turn the lights off now and we'll give the camera a second to switch over to night mode, which will be black and white. There it goes right there. All the lights are off in the room right now. I have a few computer monitors on and the door cracked about halfway open to let some ambient light in from the hallway. You can see, although the picture is a little grainy, you can see me quite clearly, so this camera does work pretty well in low light. I'm going to turn the lights back on and we'll give it a second to switch back to daytime color mode. There it goes, and we're back to color. This is the DPRO-92311 that was just tested. It's medium size when compared to other indoor dome models, maybe a little on the small side even. As far as the video quality, I'm really impressed with the daytime performance that it provided, and I have to say that I was also quite pleased with the low light performance as well. Although the picture was a little bit grainy in low light, I was able to make out objects in the room quite well, and I was not expecting that. I would recommend this camera mostly for surveillance installations where most or all of the recording will be done with at least some of the lights on in the room. 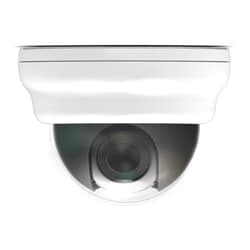 Although the low light performance is good, you can get excellent low light and even zero low light performance from one of our dome infrared cameras. For more information and pricing on this camera, please visit www.cctvcamerapros.com/92311. If you have any questions about anything related to video surveillance systems, please let us know. Thank you for watching. Click here to learn more about the DPRO-92311 Indoor Dome Security Camera used in this video.